We are pleased to announce Power Manager and Power Manager Professional 4.1.4 are now available. This latest update introduces three new Schedule Assistant tasks and fixes bugs. New in this version are Schedule Assistant tasks for creating on-demand events. These events are popular and great starting points for expanding your schedules. On-demand events differ from traditional events because they have no triggers. Triggering an on-demand event is done through the menu bar, command line, or remotely on an iOS device or another Mac. 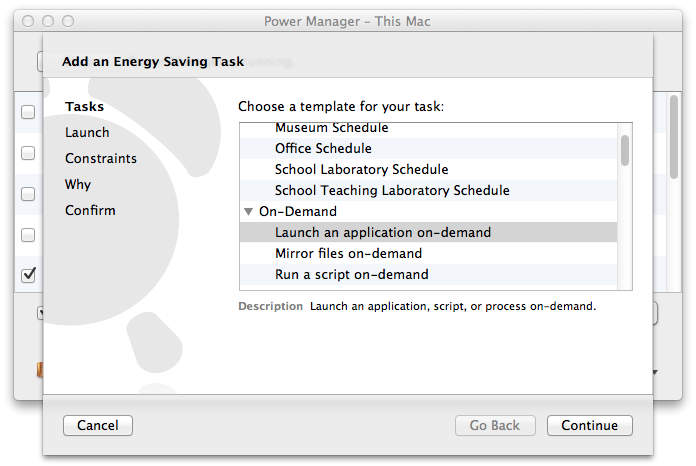 Power Manager's Schedule Assistant includes new on-demand tasks. Added: Added shell script on-demand, launch on-demand, and mirror files on-demand tasks. Added: Added support for subscription and transfer licences. Added: Added assisted move of application to Applications folder. Added: Added simplified notification option for schools. Refined: Added software update check option to removal application. This article was posted in PM4, PMPRO4, and Power Manager and tagged launch, and software update.